This month we’re celebrating the NEW release of Ceres Organics quinoa’s new compostable clothing; a transparent, triple layer, home compostable pouch! But what does home compostable mean? And how does it compare to just compost. Does it degrade? Does that make it biodegradable? There are so many terms and they all mean different things, so we thought we’d go through them here. Why quinoa first? Well, quinoa is pretty close to our hearts. For over 15 years we’ve been supporting heritage quinoa from the Andean plateau, and we felt it deserved to be packed in the best possible packaging – home compostable packaging. It only takes about 6 weeks for this pouch to start breaking down in a typical home compost bin or worm farm, which is pretty cool. You’ll see why if you continue reading on. We are incredibly proud of this world first innovation. Beyond our BioGro and EcoSocial certifications, this new packaging direction is representative of our ongoing dedication to work with nature to make the world a better place. 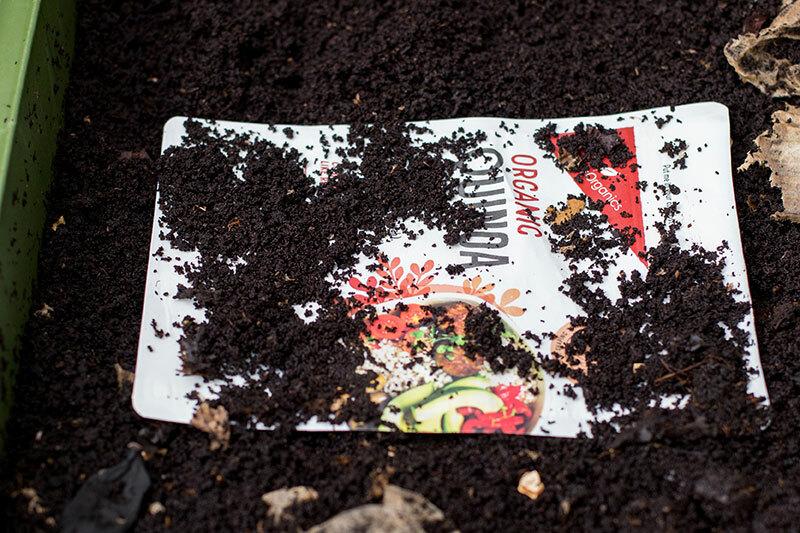 Read on below for the low down on the difference between degradable, biodegradable, compostable and home compostable – and how you can compost our new home compostable pouches. All plastics (bioplastic and traditional) will biodegrade to a certain extent under suitable conditions, but many take hundreds of years and produce harmful residues. This creates a little bit of confusion. The word “degradable” really just means that something breaks down. Technically, all plastic is degradable plastic. You can break it with a hammer. You can grind it into a fine powder. This all counts as “breaking down” the plastic, and therefore (technically) “degrading” the plastic. Some plastics have added chemicals that will make the plastic break down faster under certain conditions. For example, you can add an additive to normal, petroleum-based plastic that will make it become brittle and crumble in sunlight: this is referred to as making “photodegradable” plastic. Other additives can be put into plastic that will make plastic break down by oxidation: this is referred to as making “oxo-degradable plastic.” These methods will make the bulk of the plastic appear to disappear; however, the small particles which are produced by this effect are still small pieces of plastic. Nothing has changed, the plastic material does not “return to the earth” in any real way, it just gets really, really, small and actually creates a much bigger problem in our environment and eco-system as “invisible litter”. Biodegradable Plastic is plastic which will eventually degrade from the action of naturally occurring microorganisms (e.g., bacteria, fungi). However on its own the term is to a degree obsolete as there is no time requirement for the biodegradation of biodegradable plastic nor is there any requirements for “eco-toxicity” (harmful residues) which may be left behind. Compostable products are biodegradable materials that break down quickly under defined conditions that can support plant growth. A compostable product must meet specific criteria in terms of time, environmental conditions and quality of compost produced. Many bioplastic products are designed to be compostable. However, in many cases, this compostability will only occur in the tightly controlled conditions of industrial composting facilities and there are not yet sufficient kerbside collections of this material to ensure these packaging products reach these facilities. Home composting systems generally operate at lower temperatures than industrial facilities and conditions are more variable and less managed. Many bioplastics will not degrade in home compost systems, and those that do may take considerably longer. We have partnered with a New Zealand based packaging company to develop compostable food packaging that is truly home-compostable. Many other commercial ‘compostable’ products on the market can only be composted in commercial facilities. The film in which our Raw Goodness Food Bars are wrapped – that was our pilot range, launched in a similar compostable film back in 2014. Our Ceres Organics Quinoa 450g is the first product to launch in our new re-sealable, see-through pouch, a first of its kind in the market. The bag has the transparency and barrier properties required to display high quality packaged food and ensure it stays fresh without the use of any unnatural additives. It’s made using a triple layer laminate, derived from a combination of sustainably-produced, renewable wood pulp and GM-free corn sources, with each layer internationally certified to the European (which covers the UK) and American compostability standards (EN 13432 and ASTM6400). Going in below, week zero. The bags are printed using wood-based flexographic inks. 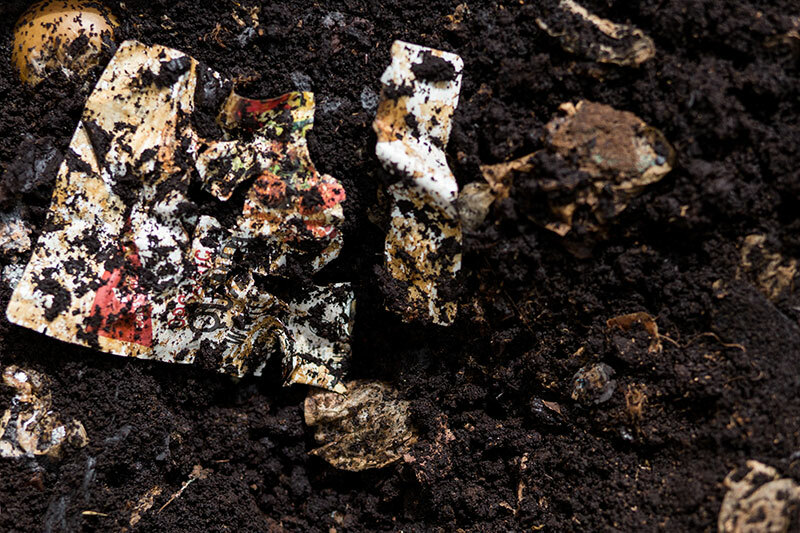 The ink pigments themselves are not completely compostable and fall under the 5% non-compostable parts allowed for in the compostable packaging standard. At the time of testing, our bags were 97% compostable. The bag is compostable when disposed of in a composting environment containing heat, water, oxygen, soil and micro-organisms, so can be home composted in this environment. In a typical home compost bin or worm farm meeting these conditions, you will see the pack starting to break down after only 6 weeks. In ideal conditions, it will have become small fragments after 16 weeks, making our packs more environmentally friendly than other plastic packaging commonly used. Sometimes there’s nothing better than getting down and dirty with compost. Assembling a home compost is easier than you’d think. And once you’re set up, it’s a beautiful gift that keeps on giving and more importantly, taking. Get rid of your household food scraps (and now quinoa packets) in this green circle of life. A bare patch of dirt at least 1m long by 1m wide (good luck to those millennials who have been enjoying luxuries such as avocado). Dry brown stuff e.g. leaves, twigs, dead flowers, wood chips or shredded newspaper. These materials are Carbon-rich and will become a good foundation for your compost. Moist “green” stuff such as your plant-based kitchen waste (veggie peels and fruit rinds, but no citrus or meat scraps), lawn clippings, seaweed etc. * You don’t necessarily need a container or compost “bin”, but building or buying one can be helpful to keep things neat. Our pouch at week 3, the worms have ripped into it! 1. On your bare soil patch, dig the area where you want to build the pile at least a hand width deep, and make a layer of course brown stuff. 2. Top with a layer of green stuff. 3. Add a thin layer of soil. 4. Add a layer of brown stuff. 6. Continue layering the green stuff and brown stuff with a little soil mixed in. Try to add stuff in a ratio of two parts brown to one-part green. 7. Cover with something – a piece of flat wood, carpet, corrugated iron etc. Covering helps keep in moisture and heat, two essentials for compost. 8. Keep the compost pile moist by watering occasionally if there hasn’t been any rain, but not soggy. 9. Mix – every few weeks give the pile a quick turn with a garden fork or shovel by moving the stuff at the centre of the pile to the outside and working stuff on the outside to the centre. This adds oxygen and helps build healthy compost organisms. 10. Once your compost is established you can just mix new compost materials in, rather than adding in layers. In a few months, you will start to see worms in the pile and the middle will turn into dark, crumbly, soil that smells like fresh earth – this is what you want to use in your garden to help your plants thrive. TIPS: Don’t use meat, fish and dairy when composting because they tend to attract animals and it’ll smell like an episode of CSI. Poo from plant eating animals is great but not carnivores like cats, dogs or bears.